In a sauté pan over high heat, add the olive oil, garlic, onion, peppers and mushrooms. Cook the mixture until the vegetables have softened. Add the spinach and chorizo and sauté 5 minutes. Strain the mixture of any water that has released from the vegetables or spinach. Set aside and allow to cool; slightly. In a large bowl combine the eggs and half-and-half, and mix well with a wire whisk until foamy. Season with salt and pepper to taste. Mix in the pasta and cheeses. Add the cooled vegetable and chorizo mixture and combine all together. Pour entire mixture into a pre-greased 13 by 9-inch baking dish. Place dish on the middle rack and cook for 25 to 30 minutes until set. Remove the pan and allow to stand 5 minutes. 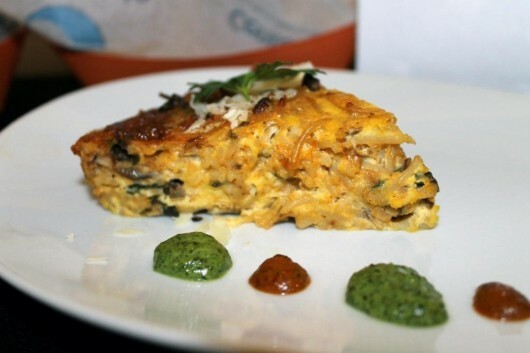 Slice a wedge of the pasta frittata and garnish with fresh parmesan and parsley. This entry was posted in Colorado Wheat Blog, News & Events. Bookmark the permalink.